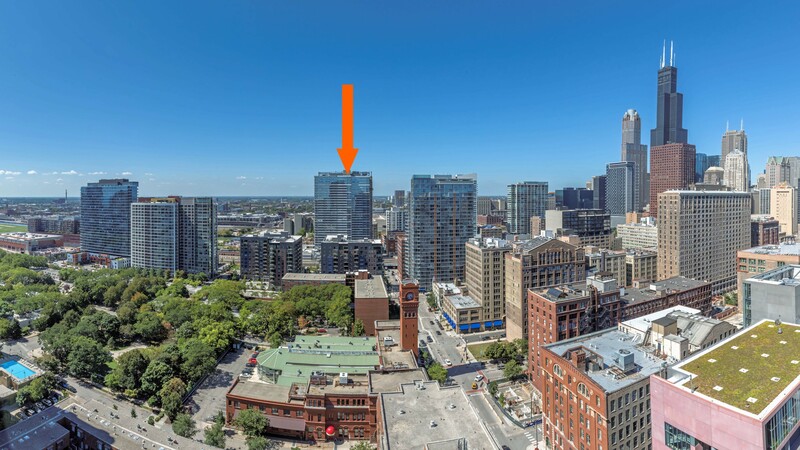 Alta Roosevelt, the new apartment tower at 801 S Financial Pl in the South Loop, is leasing for immediate occupancy. Available incentives include up to a month-and-a-half of free rent. Studio apartments at Alta Roosevelt start at $1,849 a month, 1-bedrooms at $2,009, and 2-bedroom, 2-baths at $3,359. Three-bedrooms with 2 ½ baths are all rented at this time. Floor plans and near real-time rent and availability info are online. The apartments are larger than you’ll find in many new buildings. Studios range in size from 466 to 616 square feet, 1-bedrooms from 609 to 847 square feet, and 2-bedroom, 2-baths from 1,130 to 1,305 square feet. Penthouse-level 3-bedroom, 2-baths span 1,437 to 1,476 square feet. Corner 1- and 2-bedroom apartments have balconies. The apartments feature expansive windows with roller blinds, plank flooring throughout, custom closets, in-unit washer / dryers, Nest thermostats and keyless Bluetooth smartphone entry. Gigabit internet service is available. Kitchens have quartz countertops, duotone cabinets with high-gloss uppers, tile backsplashes, under-cabinet LED lighting, Grohe fixtures and a stainless-steel Whirlpool appliance package that includes a gas range, dishwasher, built-in microwave and side-by-side refrigerator / freezer. Alta Roosevelt has extensive amenities. A Dollop Coffee outlet will serve coffee and house-made sandwiches in the lobby. Amenities include a large outdoor pool deck with private cabanas, a fire pit, gas grills and a whirlpool. The large outdoor lawn area has a bocce court. Alta Roosevelt has a club lounge and a demonstration kitchen. A well-equipped fitness center has a separate yoga and flux studio. There’s an entertainment space with a multi-screen theater. A co-working hub has smart conference rooms. High-speed Wi-fi is available throughout the common areas. Alta Roosevelt is one of the closer-to-the-Loop buildings in the South Loop. It has good proximity to the Willis Tower, the Chicago Stock Exchange, the Board of Trade and other financial trading institutions in the Loop. It is adjacent to the Printers Row neighborhood, and within a short walk of bars, restaurants and a number of local colleges and universities. Alta Roosevelt is pet-friendly, subject to limits, and has two outdoor pet parks and interior “pet spa.” The on-site garage has 348 parking spaces. Alta Roosevelt will have on-site management, maintenance and leasing staff, and 24/7 door staff.